24 December 2008, at 9:10a.m. NORTHERN IRELAND - In a review of 2008 and a new year message for 2009, Ulster Farmers’ Union President Graham Furey said farmers would be hoping for a change of fortune as the new year begins. 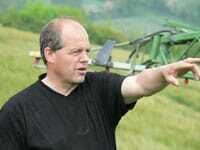 Mr Furey said, "The general feeling among farmers in Northern Ireland is that 2008 was a year to forget. The weather and prices are always top of the agenda for farmers and neither favoured producers in 2008. The seemingly incessant summer rain made it the most difficult harvest since 1985 and for some farmers, disaster struck on 16 August when flash floods washed away crops, drowned livestock and flooded large areas of our farmland." "Farm gate prices were also largely forgettable. The year began with pigs and poultry producers struggling to cope with rising feed costs; and ended with beef farmers up in arms because our prices are so far behind the rest of the UK, cereal growers returns well down on the previous year and markets for our main dairy commodities in freefall. It seems the troubles afflicting the global economy are having a knock on effect on some of our main export products." "We always look to the new year with optimism. The forces which drove up the cost of feed, fuel and fertiliser in 2008 are now in reverse and farm costs have the potential to fall." "However with farming there are always positives and there were a few for 2008. The island of Ireland has remained a Bluetongue free region and we must work hard to maintain that status. We have also received some positive decisions from Stormont, for example a more flexible rural planning policy and the decision to resist demands for an unaccountable independent Environmental Protection Agency. Some progress is being made on TB policy, but not at the speed we would like. The UFU has also been active in protecting farmers rights by taking successful court cases on duplicate fields and the 2003 Suckler Cow Premium Scheme 5% heifer ruling. We are also very proud to have raised over £130,000 as part of our 90th Anniversary Appeal to fund the building of a primary school in rural Uganda." “We always look to the new year with optimism. The forces which drove up the cost of feed, fuel and fertiliser in 2008 are now in reverse and farm costs have the potential to fall. With the Euro rising in value against sterling, it will be a significant boost to our competitiveness and export potential. The recent restoration of weanling trade to Italy and improved lamb prices are examples of what is possible”.